Here's a review of the more commonly used markers by artists and designers. Markers are great for fast sketching, putting down colours quickly. They are convenient but may not be as easy to use as you imagine. However, many artists have created awesome works with markers. Markers are quite commonly used in comic cons by artists to create commissioned artworks because there's almost no drying time. I personally have a huge box of copic markers with many colours years ago but have since gave them away. Main reason is because it can be difficult to upkeep to many colours. You'll also need to buy refills for many of them. Cost is a major issue as well because markers are not cheap, and each time I'm at the art store and see a colour I don't have, I'm tempted to get them. I still keep some Copic markers but only the grey, warm greys and black colours for quite tonal thumbnail sketches. They can be used to visualise ideas quickly. Below's a quick summary of all the features, pros and cons of the common brands that include Copic, Prismacolor, Chartpak, Sharpie and Crayola. Copic is probably the strongest brand when it comes to the markers. The 4 main product lines for Copic markers are the Classic, Sketch, Ciao and Wide. They come in 358 colours and are refillable. Worn out nibs can also be replaced. The Copic Classic (or original) comes with a square body. It holds the most ink compared to other Copic markers and can be refilled 9 times with the standard Copic refill bottle. The default nibs are the Broad Chisel and Fine Point. Additional nib options are Brush nib, Standard Fine nib, Standard Broad nib, Semi Broad nib, Soft Broad nib, Super Fine nib, Round nib, Calligraphy 3 mm nib and Calligraphy 5 mm nib. The Copic Sketch is the one with the oval body. It's refillable 12 times with one refill bottle. The default nib is the Medium Broad and Super Brush, but you can swap it out with a Medium Round too. This is the marker to get if you want brush strokes. Copic Ciao is cylindrical in shape. They are the smallest markers and quite similar to Copic Sketch with the exception of the body design. They can be refilled 12 times with one refill bottle. The nib options are Super Brush, Medium Broad and Medium Round. I personally recommend getting Copic Sketch over Copic Ciao because former has a larger body that can hold more ink so you don't have to refill that often. Copic Wide features a 3/4 inch wide tip and is good for covering large areas. It can be refilled 7 times with the refill bottle. You can also get a Broad Calligraphy nib with it. Alcohol-based Ink is permanent, non-toxic and dries acid free. Allows easy control over shades of color – shade changes according to pressure applied to marker. Allows for airbrush effect when used with the Copic AirBrush System. Wedge/Flat edge nib is stiff and durable. Refillable markers and replaceable nibs provides value in the long run, which other markers like Prismacolor, Crayola, Chartpak, Sharpies and Tombow do not offer (these latter markers are non refillable, and their nibs are not replaceable). Notably though, the nibs of Copic Ciao Markers are not replaceable. 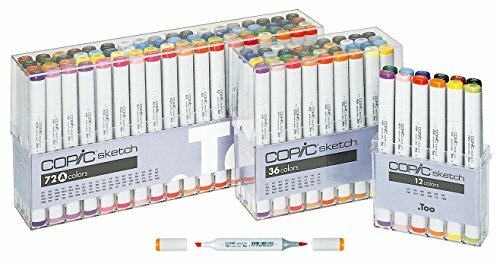 Average cost per Copic Marker is between US$3.70 - US$8.30 (Amazon Prices), depending on the type and set of markers bought (Cost Per Marker tends to be lower when bought in larger sets). This makes Copic Markers relatively expensive when compared with other brands. Check out more Copic marker reviews on Amazon. This is the other popular brand for colour markers. 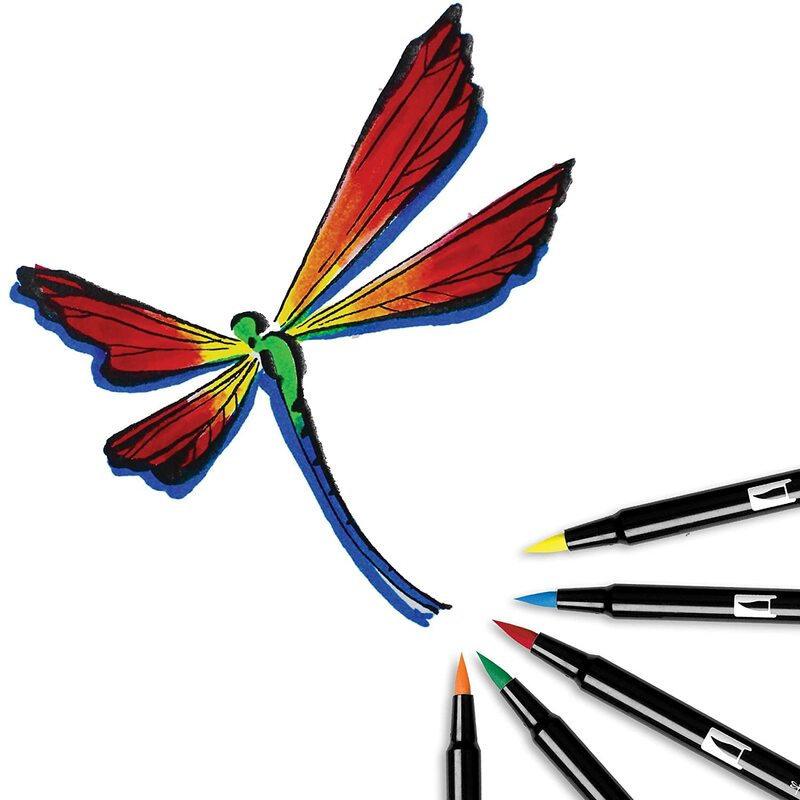 Drawing with multiple line widths is made easier for Prismacolor Markers with dual-ends – Fine tip allows for fine lines with details and chisel tip for thick or thin lines. 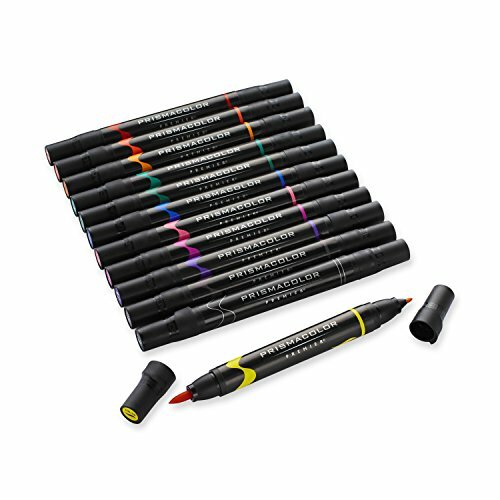 PrismaColor Markers allows for blending – apply a layer of lighter color to a darker color, and the darker color will lighten. However, blender markers (which Prismacolor also sells on Amazon) are useful for creating sparkling effect and bright whites. Relatively more affordable than Copic Markers, with prices for PrismaColor Marker ranging from US$2.55 - US$4.04 per marker (Amazon Prices), depending on the type and set of markers bought. Check out more Prismacolor marker reviews on Amazon. Sharpie markers are more for drawing than colouring because of their pointed nib which has less limited surface area compared to the chiseled nib. However, there are markers with chiseled nibs as well, just that they aren't available in many colours. Good control over thickness of lines drawn simply by varying pressure held on marker or the angle marker is held. Unlike Copic Markers, the nibs of Sharpies Markers are not replaceable and the ink of Sharpies Markers cannot be refilled either, rendering cost of replacement an issue. Sharpies Markers come with a single end/tip, unlike Copic or PrismaColor Markers which come with dual ends/tips. 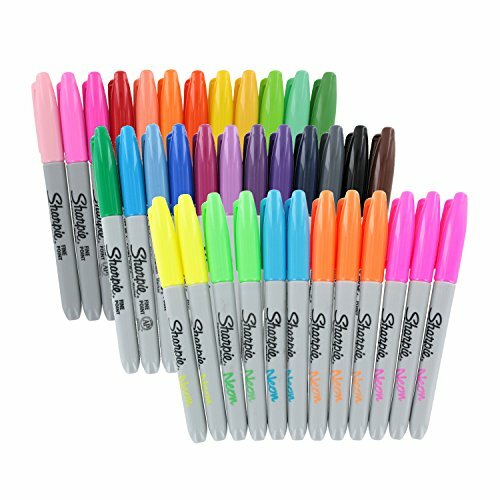 Limited choice of colors – Sharpies carry much lesser colors for its Markers when compared to Copic or Prismacolor. Ink from Sharpies Markers tend to bleed. Check out more Sharpie marker reviews on Amazon. This is the competitor to Copic Ciao and it's much affordable. Unlike most other markers, Tombow marker tips self-cleans after blending! Check out more Tombow marker reviews on Amazon. 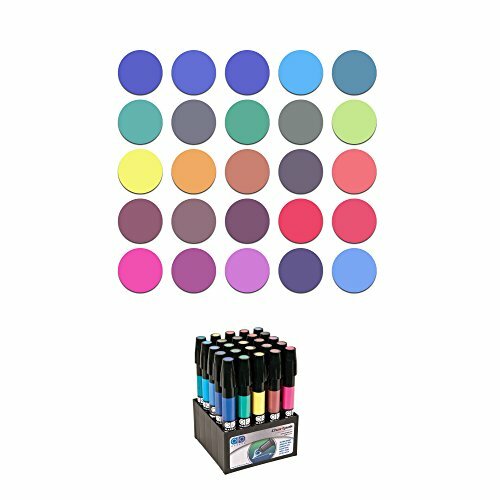 Markers sold in the 200 piece/set contain 10 different colors with 20 similar markers for each color, whereas Markers sold in the 256 piece/set contain 16 different colors with 16 similar markers for each color. 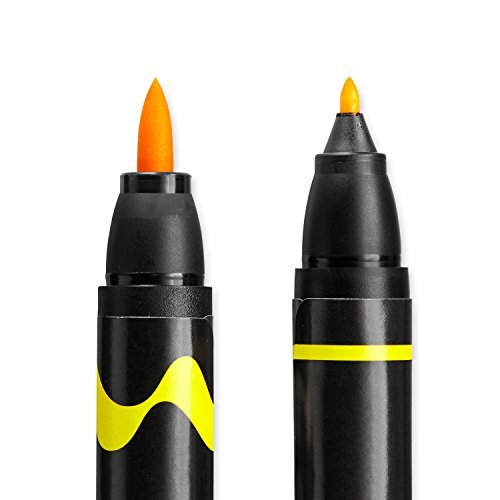 Protective feature that prevents drying out of ink – So, where marker isn't used and its tip hasn't been covered with the marker-cap, the marker dries prematurely and can its ink can be simply revived by tipping the tip in warm water for about several seconds to a minute or two. 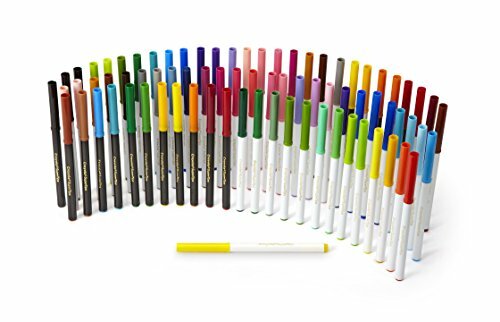 Very affordable, with prices for Crayola Marker ranging from US$0.16 - US$0.40 per marker (Amazon Prices), depending on the type and set of markers bought. This makes Crayola the cheapest marker to own, when compared to Copic, Prismacolor, Tombow, Sharpies and Chartpak. The premature drying feature can be a hindrance when you leave the marker uncapped for a while. Furthermore, revival of ink in warm water takes some time. Lifespan of the marker is generally short due to the small size/ink capacity of the marker. Check out more Crayola marker reviews on Amazon. These are big juicy markers. They bleed a bit but hold lots of ink. The smell can be an issue. Distinct odour of Xylene. Use them in a well ventilated room. Check out more Chartpak marker reviews on Amazon. Check out Utrecht Art Supplies for price comparison also.